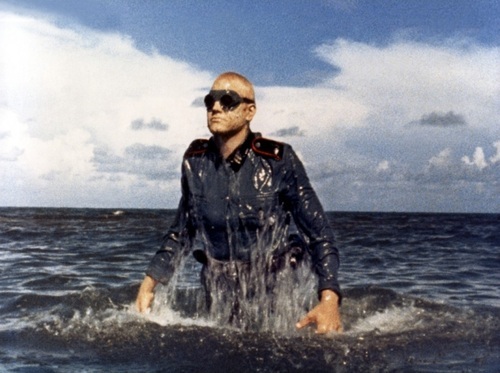 Cinema Sunday: Shock Waves (1977) | Magazines and Monsters! ← Marvel’s Unsung Heroes! – Rich Buckler! The film opens showing a picture of a Nazi platoon, and a voice telling us that during WWII, the Nazis experimented on their soldiers, while alive, but in this case, and more importantly, even after they died. The voice then tells us that Allied soldiers ran into a Nazi platoon that fought bare handed and killed mercilessly. As the war raged on, most of the Nazi soldiers were either killed or captured. None of the members of this platoon however, were ever seen again. As the action begins, we see a ship, and it comes upon a small boat, drifting along the ocean. As they look inside, they find a woman, Rose (Brooke Adams), who’s obviously been through a traumatic experience. The men beg her to tell them what has happened, and then she mentally recounts the previous few days. We see that she was a passenger on some sort of charter/dive boat, and that the boat had broken down near a small island. 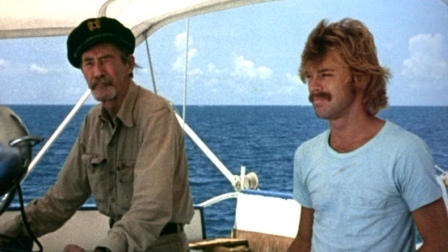 The captain (John Carradine) barks at his first mate, Keith (Luke Halpin), and tells him what direction to head out. As the boat is making its way through the waves, suddenly, it passes over a sunken ship at the bottom of the ocean. The waves get higher, and the sun turns blood-red. The captain and Keith are spooked, and so is Rose (who’s been tanning on the deck). The scene switches to nightfall, and we see a couple, Norman and Beverly (Jack Davidson & D.J. Sidney), arguing about this “cruise” they’re on. Another passenger, Chuck (Fred Buch), joins the argument, and the ship’s cook, Dobbs (Don Stout) throws in his two cents. As they all sit down for dinner, the captain notices that the passengers aren’t exactly having a good time. Norman voices his displeasure with the condition of the vessel, and about the comments that Dobbs has made. The captain tells them that Dobbs is full of it, and that there’s nothing that happens that cannot be logically explained. Norman also thinks the ship should turn back, but the captain refuses. Later that night, Rose hits on Keith, and then there seems to be something else afoot, something sinister. All of a sudden, a ship appears, and slams into the side of the vessel. The passengers and crew come to the top deck, and the captain scolds them, and tells them to go back to their cabins. The captain doesn’t believe Keith, but then fires a flare out in the direction of the ship, and sees it for himself! The next morning, Keith and Dobbs are looking for the captain, but cannot find him anywhere on the ship. Keith dives into the water, thinking he may have gone for a dive to check out the bottom of the ship, but he doesn’t find anything. The decision is then made to head over to the island, and look for him there. Keith also informs the passengers that the hull has been breached, so they must go to the island in fear of sinking. Dobbs searches for the captain, but cannot find him anywhere. The small boat that they are using can only transport two at a time (plus Keith, who’s oaring), so they have to make multiple trips. When Keith is taking Norman and Beverly over, Beverly notices something when she looks at the bottom of the boat (it’s a glass bottom boat). It’s the captain, and he’s as dead as Julius Caesar, floating under the surface of the water. They drag him to shore, and then explore the island. As they explore this creepy island, they come upon a huge residence, that seems to be empty. Out at sea, there’s activity at the “ghost ship”, and we then see some ghastly creatures walking along the bottom of the ocean. They begin to make their way toward the island. As they look around it, suddenly music begins to play, and they make there way to the room where it is coming from. Just then, a voice rings out, asking them why they are here. They explain that they hit a wrecked ship out at sea, and need help. 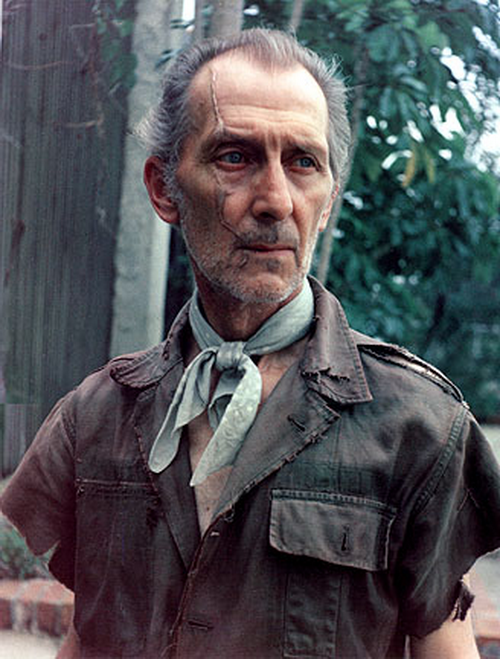 The person reveals himself to them (Peter Cushing), and explains that he’s been alone their for a long time. He asks them about the ship out at sea, and they tell him it’s old and rusted. The man then disappears, and we see him on the beach, checking out the ship for himself. We also see one of the zombies going back into the ocean. The passengers have made themselves at home in the old hotel, and bed down for the night. We then see dozens of the zombies arise from the sea, and they begin to make their way to the island. The next morning, Dobbs is cranky, but agrees to go to the ship for some food. He only makes it about halfway, before he’s assaulted by some of the zombies. They drag him under the water and kill him. Back at the hotel, the passengers finally run into the old man who spoke to them earlier. They ask for his help in getting out, but he tells them about a small boat that they can use, but they must leave tonight, because there is trouble. We then get the obligatory scene of Rose swimming around in her bikini (not that I’m complaining), and swims right into the corpse of Dobbs. She’s shaken up, and the others find a Nazi symbol in Dobbs’ hand, and then they see two of the zombies from far away, and get out of there immediately. They return to the hotel to question the old man about Dobbs. The old man explains to them that he is inadvertently responsible for the deaths of the captain and Dobbs. He explains to them about the Nazi soldier program to create these zombie soldiers or “Death Corps”, and they are a bloodthirsty bunch that has come to kill everyone in their path. He then also reveals that he sunk the ship intentionally, hoping to kill them. They don’t believe him at first, and then he tells them that they must leave. Meanwhile, outside the jungle, the zombies are making their way to the interior of the island for some more killing. Keith and the two women go and find the boat that the old Nazi told them about. Speaking of the old man, he sees his “soldiers”, and calls out to them, attempting to stop them from killing the others. At the same time, Norman and Chuck are getting as much supplies as they can bring. One of the zombies has targeted the old man, and he kills him brutally, leaving the passengers without anymore help. One by one, the zombies target the passengers, and most if not all wont survive! Listen, this is a solid film, and really good for the budget (app. $200,000), but didn’t do very well at the box office for some reason. The film was reportedly shot over a period of thirty-five days, and you can kind of tell when you watch it. Again, a low-budget usually means tight scheduling, but to reiterate, it’s a very solid film. 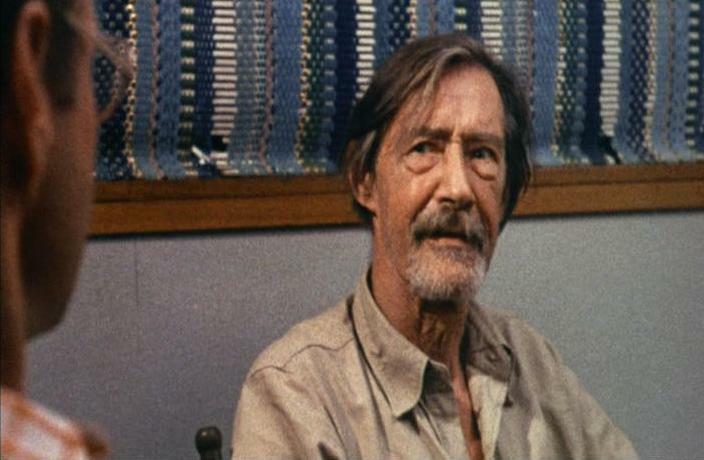 You get some decent acting from John Carradine, and also from Luke Halpin. Cushing does a great job too, but he really has very few scenes in the film. I’d guess that he only has about 20 minutes of screen time (the movie is around 90 minutes). The shots out at sea are pretty cool, but undoubtedly the best parts are those of the zombies. They aren’t too heavy with the make-up or special effects (again, low-budget), but they are still super creepy, and really give you the willies when they attack or even just rise out of the water. I’m glad I checked this one out, and anybody out there that’s a fan of Cushing, or the zombie genre, needs to see this one pronto! Heck, anybody looking for an hour and a half to kill that likes horror flicks should check it out for kicks! 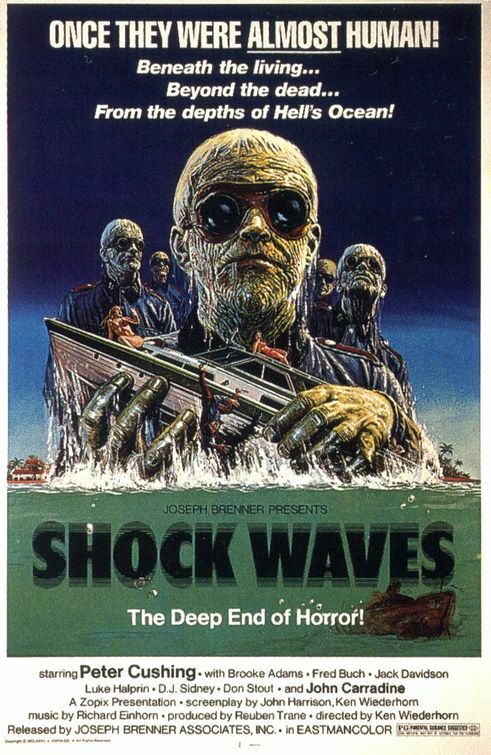 Shock Waves is one of my favorite horror B-movies. Was this the very first use of Nazi zombies? I saw this on the USA Network late one Saturday night when I was a teenager in the early 1990s, and it seriously creeped me out. For a low-budget production, it was pretty darn scary. Definitely a great example of filmmakers taking limited money & resources and making the most out of them. Certainly the direction and soundtrack were great at establishing a really creepy atmosphere. I finally bought Shock Waves on DVD a few years ago. The audio commentary with director / co-writer Ken Wiederhorn was really informative & fun. I would say no. The first time they were used was in The Frozen Dead (1966), I believe. Another good flick! This movie was a lot of fun. It combines a lot of the mysterious Island genre with classic 70s horror. Very fun watch. Yep, and Cushing is always worth a watch, in my humble opinion!